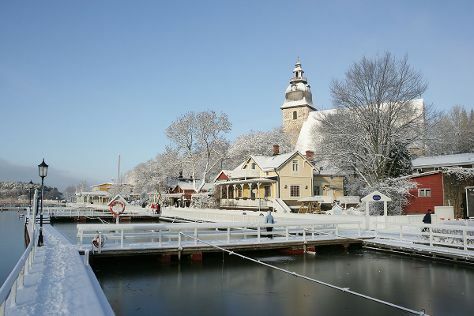 Get a sense of the local culture at Naantali Old Town and Luostarinmaki Handicrafts Museum. Visit Ispoinen Beach and Sauna and Vepsa Island for some beach relaxation. Step out of Turku to go to Poytya and see Kurjenrahka National Park, which is approximately 46 minutes away. And it doesn't end there: step into the grandiose world of Turku Castle, delve into the distant past at Aboa Vetus & Ars Nova, learn about all things military at Forum Marinum Maritime Centre, and get lost in a book at Turku City Library. To see other places to visit, where to stay, and tourist information, read our Turku tour itinerary website . Bogota, Colombia to Turku is an approximately 20.5-hour flight. You'll lose 7 hours traveling from Bogota to Turku due to the time zone difference. July in Turku sees daily highs of 24°C and lows of 13°C at night. Wrap up your sightseeing on the 6th (Sat) to allow time to travel to Uusikaupunki. Kick off your visit on the 7th (Sun): head off the coast to Isokari Lighthouse. Get ready for a full day of sightseeing on the 8th (Mon): see the interesting displays at Automobile Museum, then see the interesting displays at Bonk Museum, and then head off the coast to Katanpaa. Quickly create a custom-made itinerary for Uusikaupunki using our trip planner. You can drive from Turku to Uusikaupunki in 1.5 hours. In July, daytime highs in Uusikaupunki are 24°C, while nighttime lows are 13°C. Finish your sightseeing early on the 8th (Mon) so you can travel to Pernio. Perniö is a former municipality of Finland. On the 9th (Tue), explore the striking landscape of Teijo national park. For more things to do, traveler tips, other places to visit, and tourist information, read our Pernio driving holiday app . Drive from Uusikaupunki to Pernio in 2.5 hours. Expect a daytime high around 25°C in July, and nighttime lows around 13°C. Finish your sightseeing early on the 9th (Tue) to allow enough time to travel to Kimito Island. Start off your visit on the 10th (Wed): enjoy the sea views from Archipelago National Park. On the 11th (Thu), you'll have a packed day of sightseeing: admire the masterpieces at Soderlangvik and then identify plant and animal life at Oro. For other places to visit, ratings, photos, and other tourist information, go to the Kimito Island journey maker app . Drive from Pernio to Kimito Island in an hour. July in Kimito Island sees daily highs of 25°C and lows of 13°C at night. Cap off your sightseeing on the 11th (Thu) early enough to travel back home.